Nowhere To Hide (1999), directed by Lee Myung-se, was the film selected to open the inaugural Sydney Asia Pacific Film Festival in March. (1) A virtuoso rollick through the 72-day pursuit of a ruthless gangland assassin, the film signals exciting new developments in the Korean cinema of the last few years. Visually-striking, technically stunning, daring with genre and very funny, the film seems to slide effortlessly across nuances of mood and feeling to create both a tension and a sense of play that rivet the audience from the first shot to the last. Although a short review cannot do justice to the complexity or the innovativeness of the film, this article attempts to bite the bullet and to describe a few aspects of the film, mostly in its first ten minutes. By the time the opening titles assault the viewer with a hard-edged metallic clunk, Nowhere To Hide has already set itself up as a hard-boiled gangster/detective film that is slick, fast and furious. From the moment the film rips open with a rapid iris out, it’s all about surface: a stark bleached-out black and white industrial wasteland; a lumbering, thug-like pair of shoulders in horizontal stripes lurching across a vacant lot to the driving beat of a synthesizer; a tough, streetwise character confronting a gang of extortionists whose faces glide into frame and into focus one-by-one like choreographed physiognomies of criminality. Bodies and body parts freeze in mid-flight in a high-velocity fight scene set up as a study in movement, rhythm and stasis: cryptic poses, the energy of a moment or a movement are condensed in a single frame like living figures captured in the disjointed sequences of a cartoon, and then released back into motion. Action is segmented into its component parts, transitions between the parts excised and camera speed shifted to leave a blur of rapid, disjointed movements. From here the tone is set, bullets fired, and the camera zooms in through one of the bullet holes onto the titles. Slick, smooth, tough. Already the film has stretched and reinvented the principles of how to break up a scene and how to hold it together, how to inject lines of force that shatter the harmony, and lines of cohesion that hold the disintegration in check. After the titles, the rhythm shifts with a series of short fluid fragments, one after the other like liquid blips – a motor bike rides into frame and halts, a man walks a pace and freezes, a car window lowers halfway and pauses, the camera pans across a windscreen and stops, a man looks forward and freezes . . . movements interrupted but not truncated as the rhythm is carried on by the next fragment. Clued in by the high-voltage energies of the pre-title fight scenes, the viewer waits for the gangster film to kick in as the fragments pick up pace, and the uneasiness intensifies with the sense of anticipation, watching, waiting. Who is the man in the car, the two on the motorbike, the man on the step? There’s a sense of disorientation, fragments in a puzzle with no hierarchy to organise them. As we wait for the pieces to fall into place, the camera moves away and we’re lured into a scene of extraordinary sensory pleasure: leaves blow in slow motion in the wind – the intense, almost edible golden yellow of autumn leaves – and a melody picks up a wistful, melancholy lilt, the sweet dreaminess of The Bee Gees. (2) As the viewer is lulled by the music, the camera shifts to a set of steps washed in a hazy blue light – the 40 steps. A little girl jumps down the steps in slow motion, one-by-one, like a wind-up doll, it starts to rain, people run through the hazy rain and the music carries the viewer into a sense of eerie unreality. There’s a sense that we are simply witness to the passing of time, the passing events of a day. Across this scene of almost unprecedented sensory richness and saturation, we watch the face of the victim as he stares into the eyes of the man who has just (will have just) killed him. A sword slices through his umbrella and pauses in a freeze-frame, his hand raises and halts. As blood streams in rivulets down his face, he watches expressionless, his eyes barely flicker and then he tumbles in slow motion down the stairs, grasping after his open umbrella. Pared back, dispassionate, a most business-like assassination. A frantic chase erupts up the stairs in a chaos of running figures and slashing swords. It’s five minutes before a word is spoken in this first sequence after the opening titles. After the murder, the melody carries on as if nothing has happened, and the day goes back to its impartial witness. Cars drive off through the autumn leaves. The viewer is left speechless. The violence is not so much in the action – the slicing sword, the hand drenched in blood that turns the whole frame red – but in the way the scene splits the viewer in two. One part drifts with the melody into a dreamy, lyrical nostalgia, a sense of suspended animation, while the other is carried by the fragmented editing, glimpses of a building tension with no clues, no explanation, into an unnerving uncertainty, suspense. It is this ability to bring together apparently incongruous elements and to play them for the energies that erupt from the juxtaposition that marks many of the elements of Lee Myung-se’s film – the capacity to turn the edges, where disparate fragments meet, into edginess. The play with these incongruities has led Darcy Paquet, who publishes a website devoted to Korean film, to describe this film, and many others of New Korean cinema, as genre-bending. (3) Nowhere To Hide is a detective/gangster film which slides at times into a romantic, almost saccharine subplot – the hero, Woo (Park Joong-Hoon), is a ruthless, brutal and streetwise detective who breaks out into a cheeky, childlike playfulness as easily as he gives way to a melancholy loneliness, hankering after the assassin’s girlfriend; the film is a comedy with a violent edge – fight scenes break into farce as Woo leaps up and down with bells ringing, and as he wrestles with a suspect after a series of brutal punches, the music breaks into a tango and the embrace of combat becomes a dance; it’s an unabashedly popular, fast-paced music video with an arthouse sensibility; it’s a cartoon with live actors . . . The capacity to fling together these disparate elements in unpredictable ways gives the film a wit and a raucous playfulness, but the impact goes beyond just the transformation of genre expectations. Just as in the 40 steps sequence we are given glimpses, fragments, actions that seem peripheral but then fly together in unexpected ways, the surface of the film also becomes a fragment to be put into play, to be flung into action. It might be a pool of coloured light that takes off onto a bravura progression through garish washes of colour – a chase scene through the industrial port-side lit as a progression through hot orange-red, a cold hazy blue and a bilious green. As Woo’s combat/dance with the boxer-suspect spreads out across a cluttered rooftop, the clutter itself takes over – the scene becomes black and white, shot in silhouette, as turrets, chimneys, aerials and gas cylinders take over the shadow play of slogging combatants. If you think of a film as a set of problems about energy – how to create it, amplify it, sustain it, what shape it might take, how to push it to the limit – the solutions Nowhere To Hide invents draw strongly on this unpredictability. Any moment, any stylistic element, any generic clue or hook can become a point of departure for the film to take off into exuberant flights of fantasy and play, leapfrogging more conventional narrative transitions and picking up a wild momentum that can leave the viewer gobsmacked at the daring, laughing aloud at the unrestrained, almost slapstick humour, or in awe of the technical virtuosity of the editing. Lee talks of the noir characteristics of the port city locations he uses in Nowhere To Hide – it’s this noir aesthetic that he reinvents as a study in colour cinematography with the stylised sculptural use of coloured lighting and shadow. (4) Surfaces take prominence as much of the film is shot through moving barriers – car windows, windscreen wipers, slats, bicycle wheels – that continually reshape the frame, make it malleable, fluid, dynamic. The surface of the image itself is slick, complex, textured – candy-coloured neon lights ripple across car windows; perspective is confounded as the hero chases the assassin through Escheresque neighbourhoods of undulating reflecting glass, laneways and staircases that seem to lead only in circles. It’s noir reinvented in Korean neon. It is not only colour – rain and snow at times so dominate the image that it’s as though we’re watching the film through a texture of moving, beating rice paper thatch. Rain carries the burden of mood more often delegated to music – whole segments of the film are just wet, saturated, the pounding downpours of rain more articulate than a melody as they alternately mute and mask the action, smother it in melancholy or add a kind of desperate edge to the pursuit of the murderer. The final showdown takes up the silent structure of the 40 steps sequence – ten minutes of pursuit, cornering and the final punch-up with not a word spoken, no voice, just the relentless drumming of the rain pummelling the actors and drenching the scene in a feeling that’s almost epic, almost akin to awe. (The assassin himself has no voice, only a formidable presence – he has not spoken a word through the entire film). How can an action film do this? How can it take a fight scene and spin it off into this haunting mesmerism? In a film like Raging Bull (Martin Scorsese, 1980), we have seen a structure built around a series of fights that punctuate the film, where each one of the fight scenes takes off as a new experiment in choreography and cinematography. However, whereas Raging Bull works through the affectively/libidinally-charged fight scenes to plumb spiritual, catholic depths, Nowhere To Hide plays the surface to transport the viewer into the kind of feeling that, while not necessarily as profound, is no less intense – an overwhelming mood that washes over us, sweeps us up and carries us along. The film is in parts like a synthesis of Raging Bull and Jackie Chan – the sheer formal aesthetic pleasures that stir the audience into a heightened sensory awareness in Raging Bull, combined with the innovativeness of Jackie Chan’s play with martial arts traditions, each action sequence exploring new moves in the combination of slapstick and the martial arts/action traditions. (Russell Edwards, in the festival catalogue gives Terrence Malick and John Woo as points of reference: “Imagine the artful and objective eye of Terrence Malick trained upon a streamlined version of John Woo’s Hong Kong action flicks and you’re halfway there”). What kind of deep feeling are you having when you’re not having a deep feeling? This is one of the paradoxes of Nowhere To Hide – that it somehow manages to access an intensity that you don’t expect to be there. Hooked into the expectations of a gangster/detective film, you don’t expect to be transported into a hypnotic sensory reverie. When you read Lee Myung-se talking of this hard-boiled action film in terms of how Monet would paint a water-lily, it comes as a surprise, just as when you read him talk of the action genre, narrative and character as a ruse, a decoy that allows him to explore the properties of movement and the filmic. “The story and the characters are not the main focus of my film. Movement is”, says Lee, “this is a film about movement and kinetic energy”. (5) Lee talks of studying dance, animal movement and World Cup soccer to distil these kinetic principles, and of the rain he says, “rain is a good medium for showing how movement is essentially about stillness. And stillness contains movement waiting to be released.” (6) Just as Lee talks of the painterly use of light, there’s a translation of this painterly awareness into principles of cinematography and editing, a cinematic sophistication that would be the envy of many arthouse directors. To read the film through the lens of other works may seem perverse, but once you look you can’t fail to see them. Lee mobilises the pace and inventiveness more familiar from Hong Kong cinema: only in Wong Kar-Wai’s works since Ashes of Time (1995) have we seen a fast fragmented editing style with jump cuts, “jump dissolves” (as Darcy Paquet calls them) and shifting camera speeds to achieve such mesmeric results. In the 40 steps sequence, as you watch the umbrella tumble in slomo down the steps, you realise the sequence is a homage to Battleship Potemkin (Sergei Eisenstein, 1925). 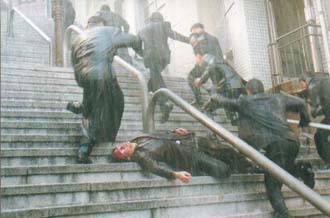 The strong horizontal lines of the steps recall Eisenstein’s Odessa steps, the victim’s slow motion tumble down the stairs after his umbrella evokes the baby’s pram, the diagonal lines of force of the gangsters running chaotically up the stairs echo the cossack’s pursuit – each element reinvents the dynamic energies of conflict in direction, movement and rhythm that animate Eisenstein’s shot construction, but reinterpret those principles within an utterly contemporary idiom. Nowhere To Hide, 1999: Director, Screenwriter & Art Director, Lee Myung-se; Producer, Chung Tae-Won; Principal cast, Park Joong-Hoon, Ahn Sung-Ki , Jang Dong-Kun & Choi Ji Woo. Quoted from an interview with Lee Myung-se published in Korea Times, Aug 11, 1999, and cited in publicity material for the film. Darcy Paquet, SAPFF catalogue. I would like to thank Juanita Kwok, co-director of the Sydney Asia Pacific Film Festival for assistance in accessing Nowhere To Hide and resources on the film, and also Sinead Roarty for editorial comments on this review. Anne Rutherford is a Senior Lecturer in Cinema Studies in the School of Humanities and Languages at the University of Western Sydney. A key focus of her research is on cinematic affect and mise en scène. Local and Global Identity: Whither Hong Kong Cinema?